We enjoy bringing readers news and information about some of the latest mobile apps out there and one that’s receiving an awful lot of media attention right now is Dream:ON. This iOS app enables the user to participate in the world’s largest dreaming experiment and it’s pretty intriguing stuff that we feel a lot of our readers might be interested in. The Dream:ON app is compatible with iPhone and requires the device to be using iOS 5.0 or later. It’s a free app and at first glance we thought it was another of the many apps available for interpreting dreams. However Dream:ON is very different as instead it’s an app involving an experiment that will attempt to influence your dreams. A year of research and development has gone into Dream:ON and it has now featured in media fields across the world such as BBC, Fox News, Sky News, The Guardian. Professor Richard Wiseman of the University of Hertfordshire launched the app at the Edinburgh Science Festival in 2012 and it gained 160,000 users in just 72 hours of availability. Around 50% of those using the app for several nights are said to be seeing results. The creators ask that users approach the experiment with an open mind and say that controlled dreaming works more quickly for some than others. In a brief outline of how it works we can tell you that the user needs to place their phone on the corner of the bed before falling asleep and the app will then monitor your sleep pattern. Once it senses you’re asleep it will then play a ‘SoundScape’ devised to help you dream your desired dream. As research shows that most dreaming takes place in the REM stage of sleep and that this is when your mind is most alert during sleep, this is the time when the soundscape will be played to your subconscious. The experiment enables you to view a graph of your movement during sleep, place a short description of your dream to the Dream:ON experimental Dream Bank and tag a friend on Facebook if they appeared in your dream. Data supplied to Dream:ON remains anonymous but one use for it that we found particularly interesting is to find out if world events can influence the dreams of a nation. If you want to try out this free app head to the download link here. You can also view the video about this app that we’ve embedded for you below this story. Features include two free SoundScapes with more on the way, a SmartAlarm (that wakes you at the required moment), sleep monitor and dream graph, dream diary and much more. Meanwhile the requirements of the app are that you don’t lock the screen of the device (will turn off automatically), should place the app close to your head on the bed and also keep the device on charge. However it’s optimized for solo sleeping and will not work with a Tempur/foam mattress. We can’t wait to have a go at this ourselves and would like to ask readers what they think of the Dream:ON iOS app. 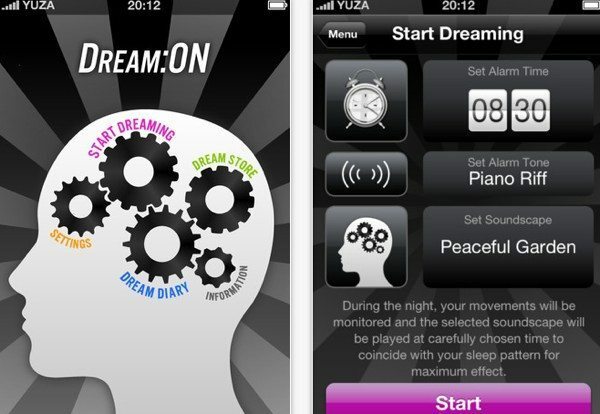 If you already use this app have you noticed any influence on your dreaming? If you try it for the first time following reading this let us know how you get on?